Single-use plastic is simply everywhere. We find ourselves not being able to live without it. For example, that lunch you eat on the go with your plastic cutlery, that straw you use for your drink from your fast-food, that cling film you use to wrap up leftovers, and of course the majority of supermarket packaging. But, you can indeed live without Single-use plastic and actually give it a boot. Here are the nine reasons why. Number one, it enters our food chain and ends up on our plate, often in the form of fishcakes or inside whole fish themselves. This is simply because the fish swallow plastic as they mistake it for food and the plastic is only discovered once the fish is cut open. This obviously does not happen if you buy a whole fish. Number two, it kills marine animals and birds. Yet again, these animals mistake the plastic for food and they end up choking or having serious stomach problems. Turtles often get their heads stuck in plastic can-holders, which can result in a long and painful death. Number three, it pollutes our oceans, resulting in landfills forming on water. Micro plastics found in body scrubs end up in the ocean, as they cannot be filtered out. Yet again, fish mistake this for food and therefore toxic elements enter our food chain. Number four, it leaches toxins into our food and drink. That’s right, plastic is also in our drinking water. You can read more about this in our blog. Number five, only 9.5 % of plastic is actually recycled. This is due to carelessness and lack of technology. Many people are lazy and will not put their rubbish in a bin. This results in the wind carrying rubbish into our oceans. 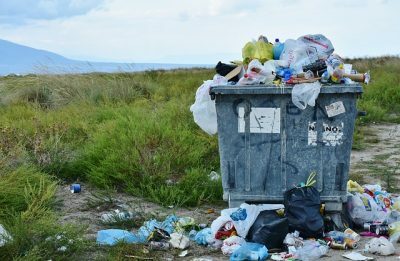 Another factor is the lack of technology, as we cannot recycle some single-use plastics, therefore they end up in landfill, where we crush them and bury the plastic under ground. What are we doing to the world? Number six, it will still be here in hundreds of years. A plastic bottle takes 250 years to decompose. A plastic carrier bag takes 15 years. Cling film takes 25 years. You get the point. Number seven, it’s actually made from fossil fuels. This means that we have to keep taking oil from the earth and we really don’t have that much left. So you’re thinking that there’s no hope. Incorrect – there are alternatives. For example, use metal cutlery for your on-the-go lunch (just keep some with you), don’t use a straw at McDonald’s (just go without one), wrap up your leftovers with reusable cloths or put them in reusable containers. And as for super market packaging, try to buy loose veg and meat/fish from the counters that aren’t pre-packaged. AND use remanufactured toner cartridges. Good luck! Challenge yourself and don’t give up yet. We can stop this plastic addiction if we help each other, so give single-use plastic the boot once and for all.